Colorado’s FY5 proudly swim in the deep currents of American music, playing new songs, well-informed of country and bluegrass traditions. 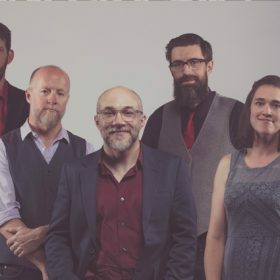 Featuring thoughtful arrangements, strong singing and musicianship, the band strives to connect to listeners with stories of common struggles and big ideas. While their sound evokes timelessness, it is decidedly contemporary, well-traveled 21st-century sensibility that informs their songwriting. As they share the stories that drive the songs, FY5’s show leaves listeners certainly with tapping toes, but ranging thoughts as well. FY5 is excited for the release of their 4th full-length album in early 2018, The Way These Things Go, featuring their trademark story songs, clever arranging, and catchy hooks. The band was selected as official showcase artists for the 2017 International Bluegrass Music Association conference including a songwriter showcase with Mike Finders.